Just imagine. You are walking down Orchard Road. It is the Chinese 7th month or what is popularly known as the Hungry Ghost Festival. Suddenly from all around, staggering towards you are zombies, the living dead. You screamed in horror. Unlike the movies, you have no wooden stake, no silver bullet, no weapon. All you can do is run, run and run. Yes run away from zombies in Orchard Road, And that is going to come true on 8 September 2012 at dusk when the sun starts to set. 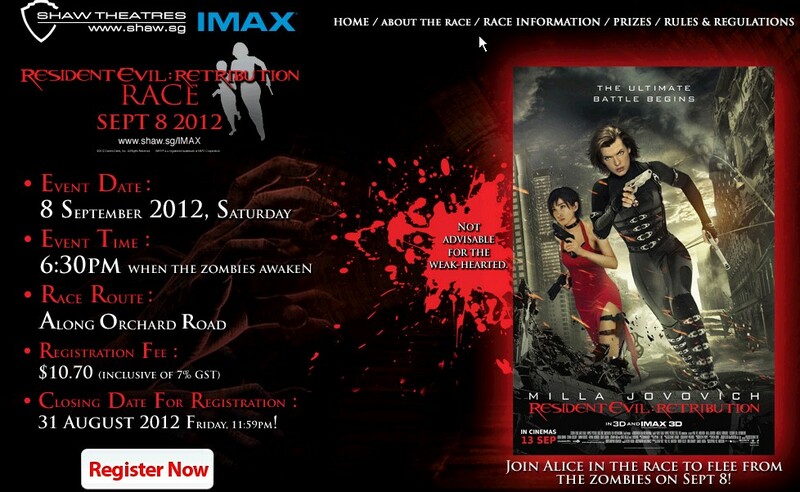 Believe it or not, there is going to be a race against the zombies right in Singapore! There are all sort of running races in Singapore nowadays. From charity run to ultra-marathon, from night trail race to relay, theme race to barefoot race, everything is available for the runners wannabe. And now for the movie nd runners aficionados, there is the Resident Evil: Retribution Race. This has got to be one stylo milo race if it is well executed. Imagine runners being chased by “zombies” all over Orchard Road. I can’t wait to be there to witness this. Too bad, I won’t be in town that weekend. Registration close 31 August. What are you waiting for? Zombies to get you? Quickly go and sign up. Its only $10.70. Cheap cheap.